Zapier lets you connect Leadfeeder leads to the apps you use, e.g. your CRM, Google Sheets, Slack and many more. For further inspiration, it's worth checking here different pre-made templates for connecting with your favourite app. 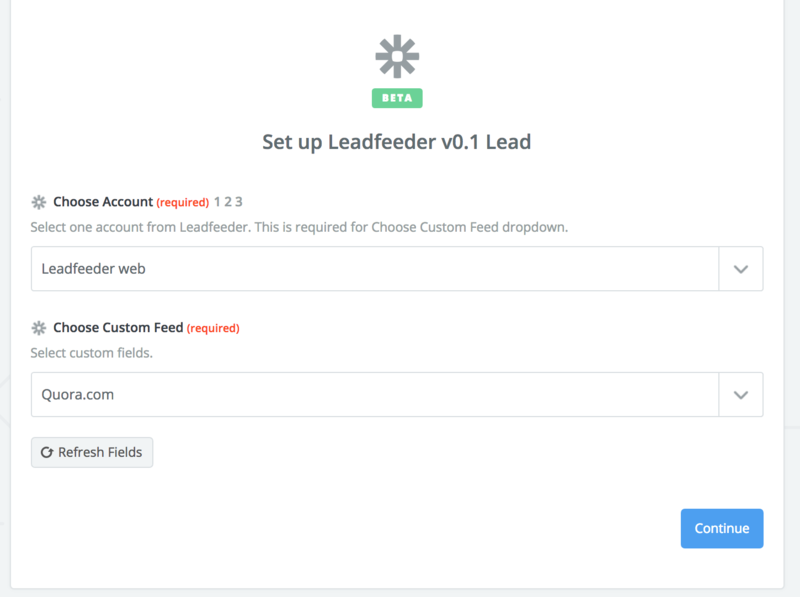 STEP 1: Go to your Zapier editor and choose Leadfeeder app. 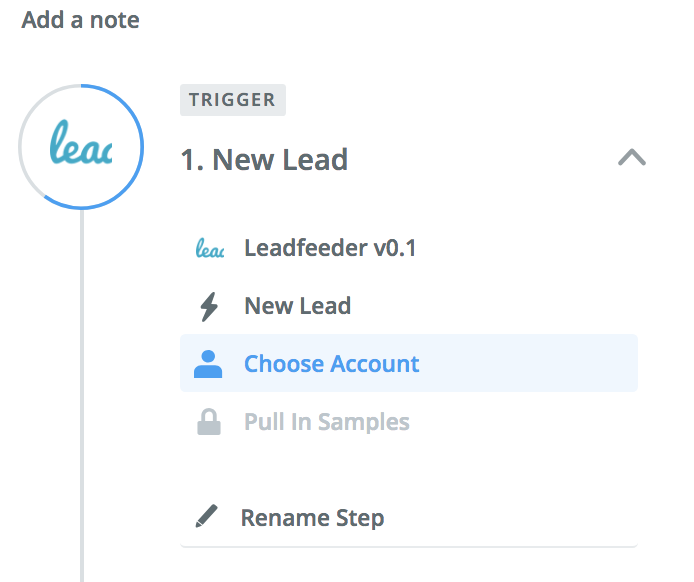 STEP 2a: New lead refers to leads that are appearing on your website for the first time during your Leadfeeder tracking history. STEP 2b: Recurring lead is meant for cases where you want to keep track on some specific lead(s) coming back to your site. NOTE: Recurring lead will trigger also when the lead visits your site for the first time, so it'll covers the visits of New Lead as well. For example if your custom feed matches to the leads where "source/medium is quora.com", the Zap will be triggered by New lead only when a company X comes to your website referred by quora.com and that company has not been tracked before by Leadfeeder. Recurring lead would, in turn, trigger every time the company matching the criteria comes to your website. If the company visits multiple times per day, only the first visit of the day will trigger the Zap. STEP 3: When connecting to Leadfeeder, use the Zapier token you created by following instructions of this article. Choose a Leadfeeder account you have access to and then which custom feed you want to pull the data from. STEP 5: Continue and finalise the trigger. Now the Zap will be triggered when ever a new lead/recurring lead matching the criteria of the custom feed is appearing. STEP 1: Select the Search to be Leadfeeder, choose Find Lead and click Continue. STEP 2: Select the wanted account and click Continue. STEP 3: Choose wanted options for the fields Account, Search Field and Search Value. Search Field can be either Name of the lead or Website URL. Click then Continue. STEP 4: You can preview the search by clicking View your lead on the next view. Click then Continue to define the Action.